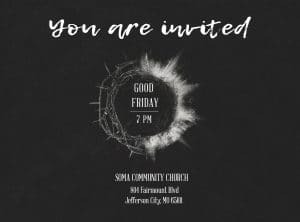 Join us as we gather together for a Good Friday observance. The service will be based around worship music and readings from the stations of the cross. This is an important time for christian reflection as we prepare ourselves for Easter. It is important that we have these times of corporate worship because it reminds us that we are not in life on an island. We are working with brothers and sisters all over for one great mission.